The Bulls & Goats Calculator calculates how many public sacrifices would have been offered on your behalf if the Jewish temple were around today and we were under the Old Covenant. All the various sabbaths, holy days, festivals, etc. are taken into consideration. It does not factor in free-will offerings — only scheduled, public sacrifices offered on behalf of all people. Simply enter in your birth date below and click the "Show me" button. You can leave the "Until" field as-is unless you want to play around with dates. The Mosaic Law was given to Israel as a tutor (Gal 3:24-25) and perhaps the most predominant lesson in that law was the animal sacrifices. These sacrifices served as both a fulfillment of a divine law and as an object lesson in the necessity of a substitutionary atonement. This is the idea that the deserved punishment of a guilty part is absorbed by another party. God's character demands that he hates sin and that he punishes sin, else he could not properly be called "just" or "holy." Since the first sin, God has been teaching and showing man the divine law that springs from his character: blood for blood, that the wages of sin is death. Restitution is necessary. Human beings were the ones that violated holy law, and they were the ones responsible for their own sins. However, in the animal sacrifices God accepted a substitute: an "innocent" animal dying for the sins of human being. There were countless sacrifices, as you can see from the chart on the Results tab. There were daily, weekly, and monthly sacrifices -- in addition to several annual holy days and festivals -- made on behalf of the nation of Israel. An individual could also bring his own guilt and sin offerings for atonement. Over the life of the Mosaic Covenant, hundreds of thousands, if not millions, of sacrifices were made. These sacrifices never did what was necessary to be truly reconciled with God. They never took the sins away. They never made the sinner perfect. They had to be repeated continually to cover sins. The gap between God and man remained. There had to be a greater sacrifice, a worthy sacrifice, one that truly justified man before God, cleansed him, and made him righteous. But these sacrifices did not do that. You, my friend, have thousands of reminders that your sins are not -- and cannot be -- atoned for. They are still on your head. You cannot atone for them yourself, and the sacrifice of all those animals isn't enough. There is no hope. All those sacrifices were to teach us about the sacrifice that can make us perfect, cleanse us, justify us, and free us from the captivity of sin. What is this better sacrifice? Jesus Christ does for us what all those animals could not. He does for us what we cannot do for ourselves. 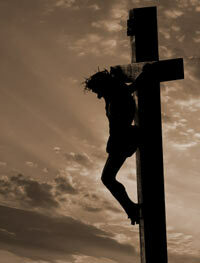 In his sinless death, in his perfect obedience, he has atoned for our sins. Jesus' atonement is for you if you confess that he is Lord and that he has been raised from the dead. The atonement is for you if you repent of your sins and turn towards him in faith. Have you learned the lesson that these thousands of sacrifices were meant to teach? Do you see that your sin separates you from God in such a way that not even thousands of sacrifices can restore you to him? Do you see your need for a savior? The choice is yours: thousands of sacrifices, which do nothing... or 1 sacrifice that does it all.